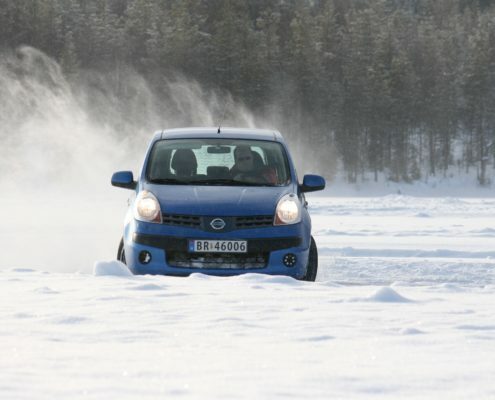 We’ve all read about ice driving courses in unpronounceable places in the Arctic Circle – well, a bit like the C1 Racing Club, but 15 years ago, we decided to do it ourselves and create a DIY version, having paid the earth to go on a couple of car manufacturer trips. We’ve been doing it ever since. The Arctic Circle is ill-served by commercial airlines, so we had to find somewhere more accessible. Röhrbäcksnäs is suitably unpronounceable and suitably cold; and has a wonderful lake that freezes over for most of January to March, so we base ourselves there. We fly to Oslo and and rent cars for the three-hour drive up to stay in ski lodges near the lake. Dutch-based Match Racing, who run 2 C1s, take a fleet of E36 BMW 318iS Compacts up there for the season for us. There’s even a C1 or two, but most of us prefer rear-wheel drive on the ice. For £1,500, you get three days on the ice, two people per car; we try to fit in some night driving one evening too; and a barbecue on the lake. There’s instruction available; and three circuits plus a pair of drift circles. All food and drink is included although it’s a good idea to bring a bottle or two of your favourite from the airport. Accommodation is basic ski lodges, in shared rooms. Flights are down to you. The emphasis is on time on the lake and having fun. Nothing fancy, just good value skids. Arrive Sunday 28th or Monday 29th evening and return Wednesday 31st or Thursday evening – if you want to stay an extra day, we can arrange that too at cost. We also have a small number of spaces over the weekend 25th-28th January.